Magazine racks from Brandenberry Amish Furniture are practical and beautiful ways to store your magazines and books. Plus, Amish artisans build each modern magazine rack from solid hardwood. So they feature elegant designs, durability and lots of storage space. Check ‘em out. 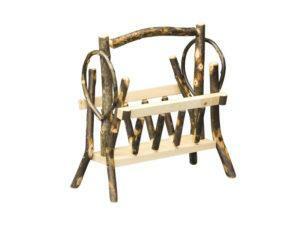 The Hickory Magazine Rack Basket boasts a one-of-a-kind rustic style. 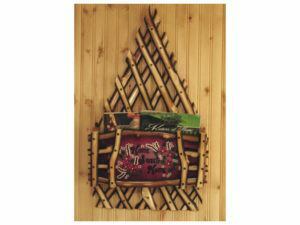 Beautiful woodwork accents the Hickory Wall Magazine Rack. Nothing can replace the convenience of having a magazine rack right next to your favorite seat in your living room or den. 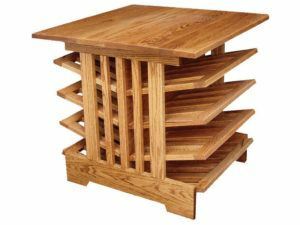 And the collection of magazine racks from Brandenberry Amish Furniture gives you several excellent units to choose from. Most bargain magazine holders are made of metal, wood composites or woven materials like wicker, rattan or banana leaves. But Brandenbery’s Amish builders use solid hardwood. So our racks are very sturdy. And they will blend with and accentuate any type of home decor. What’s more, we can customize the wooden magazine rack(s) you choose to meet your requirements.